Last year, the Aquarium called on California legislators to pass the Straws On Request bill. As that law takes effect—and Monterey Bay communities adopt new local laws to cut back on single-use plastic—we’re working with our colleagues in the Disability community to ensure that anyone who needs a plastic straw can still access one. In today’s guest post, Allie Cannington of the Disability Organizing (DO) Network discusses the results of a new study assessing the suitability of alternatives to plastic single-use straws for people who need them. DOnetwork is a program of the California Foundation for Independent Living Centers, funded through the Department of Rehabilitation and State Independent Living Council. As of January 1, 2019, full-service restaurants in California may only provide straws when customers ask for them. At the same time, some cities and counties across the United States are passing local laws restricting straws and other single-use plastic materials. At first glance, straw bans—intended to slow the rate of plastic pollution, particularly in our ocean—may seem beneficial for everyone. And yet, they can also threaten the independence of many people with disabilities. Russell Rawlings, left, tests a reusable stainless steel straw with a silicone tip as part of the Disability Organizing Network’s study. Russell Rawlings, a Disabled advocate from Sacramento, reminds us that straws are an assistive technology tool. The AT Industry Association defines assistive technology as “any item, piece of equipment, software program, or product system that is used to increase, maintain, or improve the functional capabilities of persons with disabilities.” Other well-known examples of assistive technology include wheelchairs, hearing aids and speech-to-text technology. Hundreds of thousands of people with disabilities rely on straws as assistive technology every day. Historically and to this day, single-use plastic straws have provided people with disabilities access to independence, community integration and public life. This month, we’re asking Aquarium visitors and social media followers in California to support the Straws On Request bill—and join the movement to combat ocean plastic pollution. 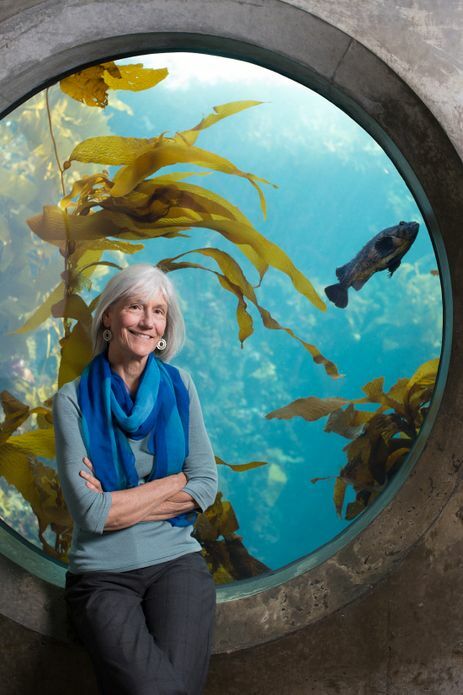 We sat down with Amy Wolfrum, our California Ocean Conservation Policy Manager, to discuss the bill and how it connects to the Aquarium’s larger ocean conservation mission. UPDATE 9.20.18—We did it! The California Legislature passed the Straws On Request bill, AB 1884, and Governor Jerry Brown signed it into law. Beginning January 1, 2019, dine-in restaurants across the state will provide a plastic straw only to customers who ask for one. What’s the Straws On Request bill? California Assembly Bill (AB) 1884, sometimes called the Straws On Request bill, would require that dine-in, full-service restaurants across the state provide straws only when customers ask for them. Assembly Majority Leader Ian Calderon introduced the bill in response to a growing body of science showing that plastic pollution is a real problem for our planet—especially the ocean. Why is plastic such a problem for the ocean? It’s estimated that nearly 9 million U.S. tons of plastic enters the global ocean each year. That’s like dumping a garbage truck full of plastic into the ocean every minute! And if people around the world don’t make changes, the rate of plastic flowing into the sea is expected to double by 2025. Plastic can now be found in almost every marine habitat on Earth—from polar ice to deep ocean trenches. Marine animals are harmed by plastic pollution in two ways: when they accidentally eat it, and when they become entangled in it. Today, thousands of people wearing blue will form a human wave in Washington, D.C.—and in cities around the world—during the first March for the Ocean. It’s a show of solidarity for the global sea that unites us, and on whose health our survival depends. Participants are marching to oppose offshore oil and gas drilling, help protect coastal communities from rising seas and other climate disasters, and end the flow of plastic pollution from land to sea. March for the Ocean is organized by the Blue Frontier Campaign and supported by over 100 partner organizations, including the Monterey Bay Aquarium. In California, supporters will march in San Francisco and clean up a beach in Playa del Rey. Click here to find an event near you. If you can’t attend a march in person, you can join the livestream at 10:30 a.m. Pacific Time / 1:30 p.m. Eastern; speak up on social media and tag #MarchForTheOcean; and wear blue. To learn more, visit www.marchforocean.com. Featured image: Rose Atoll National Marine Monument. Photo by Ian Shive/USFWS via CC BY-NC 2.0. This image was cropped. Each year, global leaders gather at the Our Ocean conference, pledging meaningful actions to protect the health of the global ocean. This year, on the Mediterranean island of Malta, Monterey Bay Aquarium was at the heart of several key initiatives addressing fisheries, aquaculture and ocean plastic pollution. Former U.S. Secretary of State John Kerry, who launched the event in 2014, announced a new partnership between the Aquarium and the Carnegie Endowment for International Peace. Through the Southeast Asia Fisheries and Aquaculture Initiative, we’ll work with regional governments and seafood producers in Thailand, Indonesia, Myanmar, Vietnam and the Philippines to overcome obstacles to sustainable seafood production. Makana stood on a cart at the front of the room and sized up the crowd. Her caretaker offered a few gestures to make her comfortable, scratching her under the chin and misting her with a spray bottle. Then the Laysan albatross partially opened her glossy dark wings, to appreciative murmurs from the audience. It was as if she knew this was an especially important crowd to impress. Aimee David, director of ocean conservation policy and initiatives, addresses the Aquarium Plastic Pollution Symposium in Monterey. 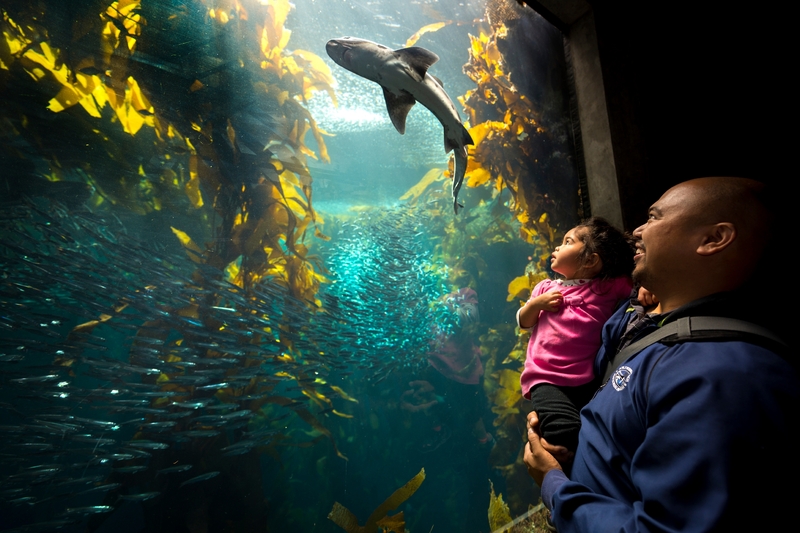 Watching Monterey Bay Aquarium’s “Makana Show” in front of our Kelp Forest Exhibit were more than 100 professionals from aquariums across the U.S. and Canada, along with experts from scientific institutions, nonprofit organizations and government agencies. They were gathered in Monterey for the first-ever Aquarium Plastic Pollution Symposium, which was hosted by Monterey Bay Aquarium. Over the course of three days, from December 5-7, the group discussed how aquariums can work together to tackle the problem of plastic pollution in our ocean, rivers and lakes. For many of us, this past week has been a time of deep reflection about what the future holds—for our families, for our country and for our planet. All of us working for change, whether ocean conservation or human rights, will face daunting challenges and uncertainty in the time ahead. But as I’ve been reflecting over the past few days, one thing has been a constant—how grateful I am to work for an institution that is such a positive force for change, and all made possible by people giving of their time, their support and their conviction. We must continue to demand change and make it happen. And we will, despite the ups and downs of politics. Thanks to you, the Aquarium will continue to amaze and delight families from all over the world; spark a love of science and nature in young people; offer a sanctuary for wonder and reflection; and become an experience infused in the lifetime memories of millions of people. Our work to inspire conservation of the ocean begins when we touch the hearts of visitors. Of course, the Aquarium itself is where our mission just begins. As we look to the future, I believe our approach to achieving conservation impact for the ocean will be more relevant and powerful than ever: engage consumers, work with business, bring science to conservation solutions. Where governments are ready to commit to effective ocean policy, help them do it.